The cover has a picture of Nagai Nobuko (永井信子). 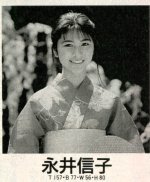 Inside the magazine, there is only a tiny monochrome photo and article about Nobuko. Nobuko is also on the cover of the next issue of Beppin (123).